Good recipe. 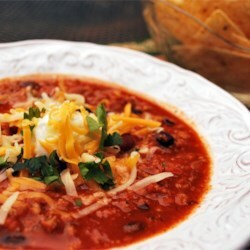 I've made a turkey chili similar to this for a few years. I find the proportions here are substantially similar. Some of the time, I have to omit the bay leaf (personal taste) and tone down the red pepper flakes and add a bit of garlic. But all in all, this recipe is fine. Thank you for sharing.